Bloodroot is Amy Greene’s first novel and the first four pages of the paperback version of this national bestseller is packed with praise from the likes of Wally Lamb (you all know he’s a personal favorite) to the New York Times. All I can say is, someone was pulling in some favors. 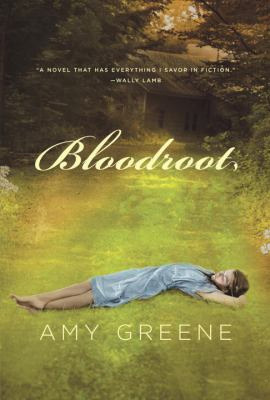 Bloodroot is an epic (in that it spans more than a hundred years) story of a family whose beginnings are on Appalachian mountain of Bloodroot. It is divided into three parts; part one & two alternate between two narrators each. Part three is a single narrator – the grand daughter of the feminine voice from part one and the mother of the feminine voice in part two. The epilogue is the husband of the part three voice. Confused yet? I’m not sure if I was more disappointed in that Greene tried to do too much – tell too many stories – or that the ones she told felt stale and flat. Life is hard, especially when you’re living off the land; girls marry boys for the wrong reasons, which often leaves them ill-equipped to be mothers; and men abuse women, especially when they drink. I kept thinking I’d read this before. Another contemporary, though more experienced novelist, that I read recently was Ron Rash. I’ve been meaning to read something by him since Patti Henry recommended him as one of the best current Southern fiction writers. My mom read & reviewed Serena a year or so ago. 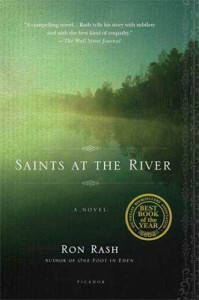 Saints by the River is set in a fictional town along the Georgia / Carolina line, not too far from where I grew up. It tells the story of a small community divided over the lost body of a young girl. She drowns in the river and her body is caught behind a natural hydraulic. Her parents and a constituent of the community want to get her out – requiring a temporary dam be built to stop the flow of water. Environmentalists are adamantly opposed to any construction – temporary or otherwise – that might set a precedent for future development along the river’s natural habitat. The main character is Maggie, a newspaper photographer who is assigned to cover the debate with another journalist, forcing her to return to the small town that is her home and face what she’s been trying to leave behind. There’s a bit of a love story, as well as the mending of broken family relationships. The narrative is focused and progresses quickly along its channel. My one criticism is that there are times when Rash pushes the Southern element on his readers. He explains things that Southerners understand without being told, and in doing this I think makes his characters say things they really wouldn’t say. One example is when Maggie explains to Allen why he should pick apple pie over peach pie, since the apples are native grown and so the locals would see him supporting the resident economy. These bumps in the dialogue are just that, bumps, minor irritations that are easy to navigate around. Saints at the River is a good read that contains glimpses of a great writer, one that I look forward to reading more of.